Diane will speak about how marketing an organization, takes skill, patience, and a complete understanding of all the methods of communication. In an accredited Zoo, the world is watching and hoping to catch you doing something unethical or mean. Roger Williams Park Zoo, one of the 232 accredited zoos nationwide, leads in conservation efforts, environmental education programming and just plain fun. How is all that communicated with the public, members, stakeholders, environmentalists, animal lovers and animal haters. Diane is the Director of Marketing and Public Relations at the Rhode Island Zoological Society/Roger Williams Park Zoo has over Thirty years of experience in the non-profit arena. 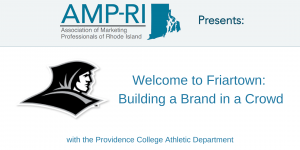 In her former role as chief marketing and membership officer of the YMCA of greater Providence, she was responsible for developing and driving an integrated marketing communication strategy that connected traditional and electronic media, as well as marketing and cause related messages. Nahabedian received her BA from Brandeis University, and MS in public relations/communications from the College of Communications at Boston University.